(Fantastic Four I#173 (fb) - BTS) - The "Medieval World" described in this profile is a planet located somewhere within the same "sector of space as Earth." (see comments) Oddly, the plantlife which evolved on this planet resembles similar plantlife on Earth. 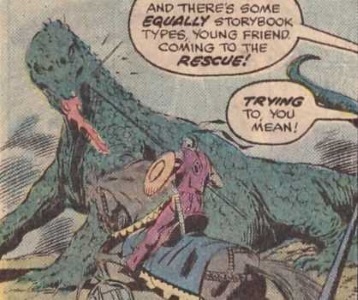 (Fantastic Four I#174 (fb) - BTS) - Over time, a race of intelligent herbivorous quadrupedal reptilians evolved, and came to "rule" their planet. (Conjecture) - Later, the reptilian race MAY have began to decline, and their numbers may have begun to dwindle. Or maybe not. (See comments). (Fantastic Four I#174 (fb) - BTS) - Eventually, members of the Skrull race discovered the planet. Possibly inspired by the fact that the dominant lifeform resembled the "dragons" from Earth mythology, these Skrulls decided to modify the entire planet to their chosen life style which was, apparently, a "knights and dragons" fantasy patterned on the human society that existed in Europe during the Middle Ages. 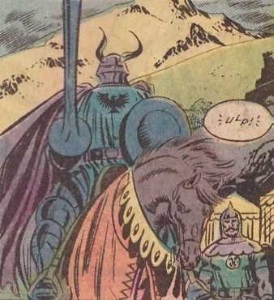 As part of their role-playing, the Skrulls assumed and maintained physical forms that resembled Caucasian human beings, wore clothing like that worn by medieval Europeans, rode "horses" that were actually mechanical in nature, and built themselves (at least) one castle into which they incorporated their space-ship, disguised as one of its towers. With their preparations complete, these Skrulls then set out to enjoy the challenges and pleasures of living as Medieval humans. (Fantastic Four I#174 (fb) - BTS) - Unfortunately, since this Skrull version of life during Europe's Medieval period included the idea that "knights" should battle "dragons" and kill them, the population of the intelligent reptilians began to decrease until, eventually, there was only one last survivor. (Fantastic Four I#173 (fb) - BTS) - Meanwhile, from his asteroid base in orbit around the artificially-created planet of Counter-Earth, the evolved human known as the High Evolutionary used a new device of his own creation to search for other inhabited planets. His bio-probes managed to locate at least three such planets in his sector of space, including the reptilians' homeworld, before the search was interrupted. (Fantastic Four I#172 (fb)) - After discovering that the existence of Counter-Earth had been sensed by the Destroyer, an Asgardian construct that was then serving as herald to the world-devourer Galactus, the High Evolutionary quickly evolved the golden gorilla Gorr to intelligence and then sent him to the original Earth to find the Fantastic Four, a super-human team who had previously defeated Galactus, and bring them to Counter-Earth. 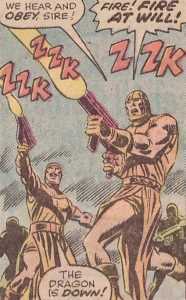 The High Evolutionary then began trying to repulse the Destroyer before Galactus could arrive. (Fantastic Four I#174 (fb) - BTS) - The last reptilian learned that the machinery which kept the horses of the Skrull knights functioning was a walking computer built in the form of a young human female, and decided to destroy "the girl" so as to strike against his enemies. (Fantastic Four I#173) - Later, after Galactus had arrived at Counter-Earth, the High Evolutionary and Mister Fantastic tried to persuade him to not devour the planet. In response, Galactus offered them two alternatives: He promised to spare Counter-Earth if they would find for him a highly-populated substitute world, either one which would volunteer, down to its last inhabitant, to sacrifice itself to his cosmic hunger or a world which the four Earthlings would personally earmark for total destruction. Unable to think of any other course of action, the humans decided to try to find a world that was willing to sacrifice itself for Counter-Earth, and the High Evolutionary used his recently-perfected teleportation device to send teams to two of the three inhabited planets which he had recently located. Accordingly, the Human Torch and Gorr were transported to an Earth-like planet while Mister Fantastic and the Thing were sent to a mechanical-looking planet which turned out to be Mekka, homeworld of the Mekkan race. (Fantastic Four I#173) - Having located the girl, the last reptilian menaced "her" with his flame-breath. Two knights tried to rescue the girl but their lances had little effect on his hide. Suddenly, two aliens appeared on the planet in close proximity to the battle. Unaware of what was really going on, the duo sprang into action and, while the Human Torch distracted the "dragon" with his flame bursts, Gorr grabbed the "maiden fair" and carried her, screaming, to safety. The reptilian quickly retreated, surprising the Human Torch who had thought that his attacks hadn't really been getting to it. However, before the two visitors could introduce themselves, they were struck down from behind by the lances of the knights who then tied their wrists together and hung them on a lance for easier transport. (Fantastic Four I#174 (fb) - BTS) - The knights brought their two unconscious captives to their castle and imprisoned them in the dungeon. Gorr was simply chained to a wall while the Human Torch was placed in a wooden tank filled with water and chained so that he remained chest-deep. Sometime during the night, the king's men found the dragon sleeping in the forest and managed to imprison it in a wooden cage on wheels which would later be brought to the tournament. (Fantastic Four I#174 (fb) - BTS) - The next day, the king ordered a tournament and then went to visit the prisoners in his dungeon. (Fantastic Four I#174) - In the dungeon, Gorr finally regained consciousness and he and the Human Torch discussed their situation and how they had ended up in chains. Just as Gorr remarked that he thought that the knights' behavior had been decidedly atypical, the king arrived. The Human Torch told "Whiskers" to cut the "King Arthur crud" and asked about "this Camelot bit" and if the whole planet was "playing '1066' or what?" The king stated that the boy's words truly confused him and that he had come to see for himself "this poor fellow who is said to resemble a golden ape yet who in truth is reputed to speak, like unto a parrot." Incensed by the king's words, Gorr challenged his "most miserable majesty" to combat between the king's hand-picked champion and himself: If Gorr won, then he and his friend would go free and get any boon they asked. The king finished that thought by stating that they would die if Gorr lost. The king agreed to those terms and then revealed that he had already ordered such a tournament, "the better to watch a monster's dying agonies." Alone in the dungeon again, the Human Torch implied that if he "got the chance to sacrifice this world to Galactus" he would choose to do so. A very short time later, the Human Torch (still chained in his water tank) and Gorr (now wearing a suit of armor) were brought to the tournament. After mounting his horse, Gorr learned that his foe was to be the Dark Knight of Astralon. Their joust began badly, with Gorr being knocked wholly out of his saddle, but his simian abilities enabled him to flip himself back into place and then deliver a blow to the Dark Knight that knocked him to the ground. However, when Gorr then demanded that the king keep his word, the monarch stated that he would not decree the tourney ended until after Gorr had slain the dragon. As Gorr protested, the king called out to his men, warning them that the dragon was awake and struggling. As the dragon broke free of its cage and came for him, the king called to his men, ordering them to kill the beast with their lasers and they swiftly complied. When Gorr confronted the "medieval types" with the fact that they were not what they seemed, the king stated that the need for masks was now over and that they had not wished to spoil their enjoyment by enlightening the duo earlier. As the king revealed that they had come from another star so that they could modify an entire planet to their chosen life style, he and his men reverted to their true form as Skrulls. When asked if there was no native dominant race on that world, the Skrull leader pointed to the dragon, identifying him as "the last, late survivor of the race of intelligent, herbivorous reptilians which ruled this planet before our coming." The Human Torch remarked on how "like us" it was to assume that a world's main race always had to look human and noted that the situation was "just like that other world, that the Skrulls turned into an old gangster movie set!" When the Torch then asked why a "vegetarian" had attacked the girl, the Skrull revealed "her" true nature as a walking computer which controlled their mechanical horses, removing her head in the process. The Skrull leader then stated that, with the death of the last of the reptilians, there was no more challenge and no more pleasure for them in remaining upon that forsaken planet, and that they "must be off to find new worlds to master and transform!" The Skrulls then departed in their space-ship, their launch blowing apart the tower within which it had been concealed. (Fantastic Four I#174) - Now alone on the planet, Gorr freed his companion from his watery prison as the Human Torch revealed that he was so solemn partly because he had been as much use as a fifth wheel but mostly because this was "now a dead world -- and no good for Galactus!" (Fantastic Four I#175) - During his confrontation with Galactus on Counter-Earth, the High Evolutionary apparently created one-way viewing portals through which he could see (but not hear) what the members of the Fantastic Four were doing on the planets to which they had been sent. 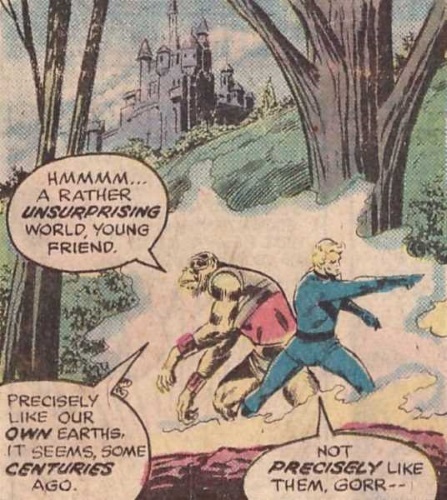 While looking at the image of the Human Torch and Gorr amidst the rubble of the castle on the medieval world, the High Evolutionary commented to Galactus, "The Human Torch and the mutated gorilla Gorr now stand upon a planet that had been re-made in the image of a medieval fairy-tale by now-departed Skrulls. Except for them, that globe is deserted now - - and useless to one who must consume various kinds of energy to live." Mere minutes later, Mister Fantastic, the Thing, the Human Torch and Gorr were all teleported to Counter-Earth's New York City to continue opposing Galactus. It was later revealed that the Impossible Man was (somehow) responsible. Comments: Created by Roy Thomas, John Buscema and Joe Sinnott. It's interesting to note that Johnny and Gorr's mission to this "medieval" planet was doomed to failure even before it began. Remember, Galactus offered to spare Counter-Earth if the Earthlings would find for him a substitute world that was "highly populated, of course." However, at the time Galactus made that offer the population (of sentient beings) on the medieval planet was already VERY small since it consisted of only the last surviving "dragon" and the group of Skrull role-players. As such, its population was probably less than one hundred and certainly far, FAR less than the three billion people on Counter-Earth. Was there one last "dragon"... or two? Fantastic Four I#173 (4 panels on page 16) - The reptilian who tried to destroy "the girl" had a short snout, a short neck and thick legs. The three toes on each of its feet all faced forward. And it did not have any fins on its tail or back and only a few very small ones on the back of its head. Fantastic Four I#174 (5 panels on pages 15-16) - The reptilian who was killed by the Skrulls had a longer snout, a longer neck and thinner legs. Of the three toes on its front feet, two faced forward while the third faced inward or backwards. And it had a VERY noticeable row of triangular fins that ran all the way from the top of its head to the end of its tail. 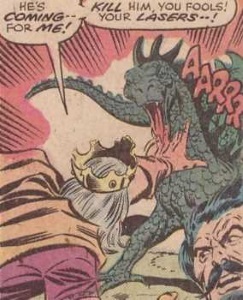 There was also a one-panel flashback on page 12 which showed a scene from issue #173 in which the dragon's shape had been changed to match how it was drawn in issue #174. So, the "real world" explanation is that either the art team (John Buscema and Joe Sinnott) decided on their own to change the design of the dragon between issues or someone else told them to do. That being the case, should the change simply be ignored by readers or should it be explained away? The only two explanations that occur to me are that either the single dragon had some limited shape-shifting ability of its own or, despite what the Skrull leader said (and presumably believed), the reptilian who was killed by his men was not the last of its kind after all. Personally, I'd prefer it if this species had not actually been wiped out by the Skrulls due to something so trivial as a live action role-playing game, but there's nothing that really supports this idea. What REALLY killed the reptilians? There is no doubt that it was the Skrulls who wiped out the last of the reptilians who were native to this planet. This belief is based on the fact that the Skrull leader identified the dead "dragon" as "the last, late survivor of the race of intelligent, herbivorous reptilians which ruled this planet before our coming." However, this statement is ambiguous since it does not directly link the Skrulls to the decline of the reptilians. For example, the statement "Dinosaurs ruled Earth before the coming of humans" is absolutely accurate but it does not mean that humans were in any way responsible for the extinction of the dinosaurs. With that in mind, some thought should be given as to whether the Skrulls, who were definitely responsible for the FINAL extinction of the reptilians, were also TOTALLY to blame for what happened on that planet. The problem I have with this idea is that it seems HIGHLY unlikely that this odd combination of live action role-playing and big game hunting could have ever been popular enough among the Skrulls that their safaris to the reptilians' planet would have reduced the native population sufficiently to drive them to extinction. After all, while there's an entire planet of "gangster" Skrulls on Kral, only one group of "medieval" Skrulls has ever been encountered. Sure, there may have been a lot more of them in the past, when there were more "dragons" available to be hunted, but I still don't see choosing the life style of a medieval knight from Earth to have ever been so popular among the Skrulls that their LARPing could have killed off many reptilians per year. Of course, it's not impossible that hunting "dragons" was once an INSANELY popular sport among Skrulls but there's no evidence of that being the case. Determining the truth of the situation is difficult because there are so few facts available. We readers witness the last reptilian being killed by a single party of role-playing Skrulls but have no firm data about earlier events. The three main facts that have not been established are how many reptilians there were on the planet when the Skrulls first arrived, how long the Skrulls had been coming to the planet, and how many of these Skrull hunting parties visited during that time. Without those facts, one can only speculate as to how responsible the Skrulls are for the reptilians' extinction. So, let's begin with the basics. If there were only a small population of reptilians when the Skrulls began hunting them and the number of these hunters was also small, then it may have taken centuries for the reptilians to be wiped out. However, if the initial population was small but the number of Skrull hunters was very large, then the extinction may have only taken decades. On the other hand, if the initial reptilian population was large and the number of Skrull hunters was small, then the hunts could have taken place over millennia, and even a large number of hunters would have taken centuries to reduce the population to dangerous levels. Of course, that's assuming that the Skrulls never decided to extensively cull the native population in order the make hunting them more challenging and thus more satisfying. Okay, I thought I was going to be able to go somewhere with this topic but that's just not happening. Apparently, I was right in the first place and there are just too few facts available to enable me to reach any conclusions about how exactly the Skrulls could have killed off the entire reptilian race just by hunting them as part of their medieval role-playing. I guess this is just a question that will have to go unanswered. ....and at the end of the story, Johnny Storm noted the similarities of this world to Kral...see an extended discussion of whether the Medieval World is part of Kral or not here. any of the MANY other races, groups, people, items or locations who are known as "dragons" or whose names begin with or contain the word "Dragon"
A silent knight who wore dark blue armor and a horned helmet, the Dark Knight of Astralon certainly looked very foreboding. As the King's champion, the Dark Knight was presumably an accomplished fighter but he never really had a chance to demonstrate his true skill in his joust with Gorr the Golden Gorilla. As their joust began, the Dark Knight scored a direct hit with his lance on Gorr's shield, knocking his opponent wholly out of his saddle. Under normal circumstances, such an unhorsing would have made the Dark Knight the victor but Gorr was agile enough to flip himself back into his saddle. 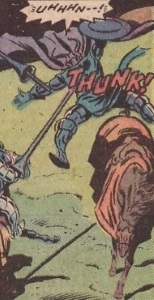 Seconds later, Gorr used his lance to strike the Dark Knight in the chest with a resounding "THUNK!" The Dark Knight uttered a loud groan as he was unhorsed. Gorr then presented himself before the king to claim his reward for being victorious but the king countered by stating that Gorr would not win until he had decreed that the tourney was ended and that that would only happen after Gorr had slain the dragon. The Dark Knight wasn't shown after his unhorsing but, like the other knights, he presumably reverted to his true form as a Skrull and left the planet with his comrades. A species of intelligent herbivorous reptilian quadrupeds who were once the dominant race upon their homeworld. Very little had been revealed about this species since only one member was ever depicted. Although described as intelligent, there was no evidence presented that they had ever developed any technology and nothing is known about their language or whatever culture they had before the Skrulls took over their world. Even what they called their race is unknown. The only reptilian encountered by beings from Earth resembled a large lizard that was about 10 feet high at its shoulders and 15-20 feet long, with a long tapering tail adding another 10-15 feet to its length. Its skin was dark green and had scales that were strong enough to resist penetration by lances and seemed to not be damaged by the Human Torch's flame. Each of its four feet had three toes, all of which ended in a long claw. The reptilian had what looked like a single row of triangular dorsal fins that began at the top of its head and continued along its neck and spine to the end of its tail, with the size of the fins on the tail being considerably smaller than those on the head, neck and back. These "fins" appeared to be flexible and fleshy (as opposed to rigid and bony) and may have been retractable. The last reptilian was a flame-breather who could emit fire from its mouth. How it could generate these flames and why its species would have evolved such an ability have never been revealed. The final extinction of the reptilian race was caused by alien Skrulls who had come to the planet to modify it to their chosen life style, which in this case was a sort of "knights and dragons" fantasy patterned on the human society that existed in Europe during the Middle Ages. With the reptilians being cast as the "dragons" in these live action role-playing adventures, they usually (or always?) ended up being killed by the "knights." Eventually, after an unspecified time, all of the reptilians had been killed except for one last male. Despite the death of every other member of his species, this last reptilian was apparently determined to fight back against the aliens for as long as possible, presumably to avenge the death of his people. After learning that "the girl" was a walking computer which kept the mechanical horses ridden by the Skrull knights functional, the reptilian attempted to destroy her when it encountered her in the forest. In an attempt to rescue the girl, two knights attacked with lances to little effect but they did delay the destruction of the girl long enough for two recently-arrived aliens to observe the battle. Not understanding the actual situation, the Human Torch attacked the "dragon" with flame blasts while Gorr rescued the maiden. Although unharmed by the flame blasts, the reptilian choose to quickly retreat, much to the surprise of the Torch who had realized that he hadn't really been getting to it. That night, the reptilian was found sleeping in the forest by the king's men who managed to trap it in a wheeled cage. On the following day, the caged reptilian was brought to where a tournament was being held so that the king could watch the dying agonies of the captured Gorr. As the king's men rolled the cage nearer, the king noticed that the "dragon" was awake and struggling just before it broke free, shattering the cage as it did so. Upon sighting the king, the reptilian began to come for him, prompting the king to call out to his men to use their lasers to kill his attacker. They immediately obeyed and the "dragon" was struck by multiple laser blasts, causing it to go down and die before it could reach its target. With the reptilian's death, the Skrulls felt that there was no further need to maintain their assumed forms and reverted to their true forms. Their leader explained to the two aliens why they had come to that planet and identified the dead "dragon" as the "last, late survivor of the race of intelligent, herbivorous reptilians which ruled (that) planet before (their) coming." After then explaining the real reason why the reptilian had attacked the girl, the Skrull leader stated that with its death there was no more challenge or pleasure for them to remain on that planet and they all quickly departed in their spaceship, leaving the depopulated planet behind. Note: Although the same art team worked on both issues, the appearance of the "dragon" was different in each issue. Does this mean that the last of the reptilians had some limited shape-shifting ability? Or could it be that the Skrull leader was mistaken when he claimed that the reptilian who was killed by his men was the last of its kind? Only the Watchers know for sure. 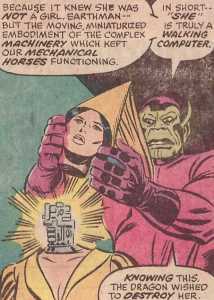 The moving, miniaturized embodiment of the complex machinery which kept the mechanical horses used by the Skrulls functional, the girl was essentially a walking computer. Exactly why the Skrulls needed this device to be mobile or why they designed "her" to look like a young Caucasian woman has not been revealed. There is no information regarding whether or not the girl was in any way sentient but apparently she was programmed to react to some situations in the same way as a young medieval woman would. One day, while walking in the woods near the castle, the girl was attacked by the dragon who had learned what she was and wanted to destroy her. Two knights tried to rescue her but their lances weren't very effective against it. Suddenly, two aliens appeared nearby, having been teleported there by the High Evolutionary. Unaware of the true situation, the visitors leapt into action to save the girl. While one burst into flames, flew at the dragon and began firing flame blasts at it, the other one grabbed the "maiden fair" so he could carry her to safety, away from her attacker. The girl reacted by screaming, appearing to be as terrified of her rescuer as she had been of the dragon. The dragon soon ran away and the visitors were then swiftly struck from behind and knocked unconscious by the knights. The next day, the girl attended a tournament which has held so that the king could watch the dying agonies of the golden-furred "monster." She sat quietly in the stands with the king and other members of his court during Gorr's joust with the Dark Knight of Astralon and didn't react when the dragon later broke free and was shot down by the king's guards. Once the dragon was dead, the king and his court revealed themselves to be Skrulls and explained that the dragon was the last member of a race of intelligent, herbivorous reptilians who had been that world's native dominant race. When the Human Torch asked why a "vegetarian" had attacked the girl, the king revealed her true nature as a walking computer and removed her head while doing so. The girl wasn't shown after her head was removed so what happened to her is unknown. The departing Skrulls could have left her behind (as a tool that was no longer needed) or they could have taken her with them...so that she could be recycled for parts to be used in their next role-playing adventure. 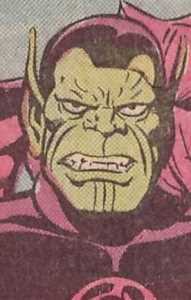 The apparent leader of the last group of role-playing Skrulls who were active on the reptilians' planet. 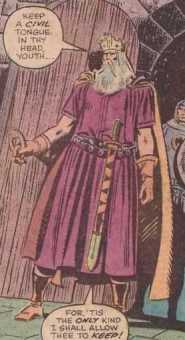 In his role as the king, this Skrull maintained the form of an elderly (but not infirm) male Caucasian human whose hair, mustache and full beard were all white. The king also wore regal robes, a cape and a golden crown adorned with red jewels, and was equipped with a sword which hung in a scabbard that was belted at his waist. However, in his true form, this Skrull was not remarkable and looked like most other male members of his race, wearing a standard purple uniform with skullcap. The king's name was never revealed. The fact that one of his men addressed him as "Sire" could mean that the Skrull was a member of his race's nobility but it's just as likely that the knight was just staying in character. The king was presumably informed when two of his knights captured two strangers (The Human Torch and Gorr the Golden Gorilla) in the forest. Later, he was similarly informed when his men found the dragon sleeping in the forest and caged it. The following day, the king ordered a tournament to be prepared in which the captives would fight for their lives. The king then visited the dungeon to speak with the prisoners. When the king entered their cell, the Human Torch commented on how their visitor "sure (wasn't) the stable-boy" to which the king warned the youth to keep a civil tongue in his head because that was the only kind that the king would allow him to keep. Johnny responded by telling "Whiskers" to "cut the King Arthur crud" and asked about "this Camelot bit" and if the whole planet was "playing '1066' or what?" The king replied that the boy's words truly confused him and that he had actually come to see for himself "this poor fellow who is said to resemble a golden ape yet who in truth is reputed to speak, like unto a parrot." Incensed by the king's words, Gorr called him a "myopic misanthropic pseudo-monarchist" and challenged his "most miserable majesty" to combat between the king's hand-picked champion and himself: If Gorr won, then he and his friend would go free and get any boon they asked. The king then finished Gorr's sentence by stating that they would die if Gorr lost and agreeing to those terms. When asked how soon this contest could begin, the king revealed that he had already ordered such a tournament, "the better to watch a monster's dying agonies." He then bid them farewell and exited their cell. A very short time later, as the tournament began, the king and his court were already seated in the stands when the Human Torch (still chained in his barrel of water) and Gorr (now wearing armor) were brought forth. Once Gorr was mounted on his horse, alarms sounded and Gorr and the king's champion, the Dark Knight of Astralon, began to ride at each other with their lances before them. Although the Dark Knight knocked Gorr out of his saddle, the gorilla's innate agility enabled him to flip back into the saddle and then strike the Dark Knight in the chest, unhorsing him. The king was then approached by Gorr who demanded his prize for being victorious but the king refused, saying, "You've not won, monster, until I decree the tourney ended, which I shall do only when you have slain yon dragon, which my men found sleeping in the forest and did cage!" As Gorr began protesting that the king's actions weren't really cricket, the king noticed that the dragon had awoken and he called out to his men, "Careful, you vermin! He's awake -- He's struggling! He's BREAKING FREE!!" As the dragon shattered his cage and came for him, the king called out to his men to kill the dragon with their lasers. His men obeyed and after a few laser blasts the dragon was down and dead. When confronted by Gorr with the fact that they "medieval types" were not what they seemed, the king stated that the need for masks was now over and that they had not wished to spoil their enjoyment by enlightening the duo earlier. As the king revealed that they had come from another star so that they could modify an entire planet to their chosen life style, he and his men reverted to their true forms and stated that the two visitors, who must have come from the planet Earth, might better know them as Skrulls. When Gorr asked him if there was no native dominant race on that world, the Skrull leader pointed to the dragon, identifying him as "the last, late survivor of the race of intelligent, herbivorous reptilians which ruled this planet before our coming." 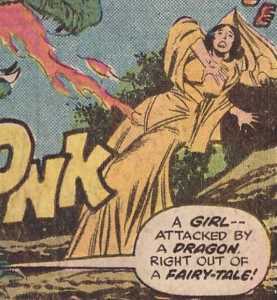 When the Human Torch then asked why a "vegetarian" had attacked the girl, the Skrull leader revealed that the dragon had wished to destroy her because it knew that "she" was truly a walking computer which kept their mechanical horses functioning, removing her head in the process. The Skrull leader then stated that, with the dragon's death, there was no more challenge and no more pleasure for them in remaining upon that "forsaken planet" and that they "must be off to find new worlds to master and transform!" The Skrulls then departed in their space-ship, their launch blowing apart the tower within which it had been concealed. Like their king, all of the seemingly-human beings on the reptilians' planet were Skrulls whose chosen life style was a "knights and dragons" fantasy (apparently) patterned on the human society that existed in Europe during the Middle Ages. 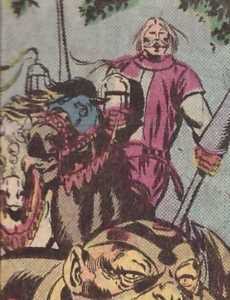 As part of their role-playing, the Skrulls assumed and maintained physical forms that resembled Caucasian human beings, wore clothing like that worn by medieval Europeans, rode "horses" that were actually mechanical in nature, and built themselves (at least) one castle into which they incorporated their starship, disguised as one of its towers. Aside from the king and his court, all of the "medieval types" seem to have chosen to be knights. Considering the warlike nature of Skrull culture, this makes sense even if the lack of common people isn't historically accurate. Two knights were escorting "the girl" through the forest when the last of the reptilians, knowing "her" true nature, attacked in an attempt to destroy her. Riding their (mechanical) horses, two knights tried to come to her rescue but their lances had little effect on its hide. At that point, two aliens who had recently teleported onto the planet intervened to save the girl from the "dragon." The knights stayed out of the way as the Human Torch and Gorr the Golden Gorilla drove off the dragon, then they rode up behind the duo and, without speaking a word, used their lances to deliver blows to the head that rendered both of the visitors unconscious. They then tied the wrists of each of their two prisoners together and hung them on a lance for easier transport. Once at the castle, the knights took their two unconscious captives to the dungeon and imprisoned them. Gorr was simply chained to a wall while the Human Torch was placed in a wooden tank filled with water and chained so that he remained chest-deep. Sometime during the night, the king's men found the dragon sleeping in the forest and managed to imprison it in a wooden cage on wheels. The caged dragon was later rolled out of the forest and nearer to the castle. The following day, as the tournament began, a knight called the now-armor-wearing Gorr a "churl" and told him to mount up because they had no more time to dally with him. As Gorr mounted his steed in a mocking manner, the knight stated that, "Thou mayest laugh out of the nether side of thy face, gargoyle, once thou dost behold the Dark Knight of Astralon!" During the joust, the knights stayed out of the way and watched as Gorr defeated the Dark Knight. Several knights then began wheeling the cage containing the dragon into the arena but when the dragon broke free and the king called out for his men to kill the beast with their lasers, several of the knights swiftly produced handheld laser weapons and used them on the dragon. Once the dragon was dead, the king stated that the need for masks was now over and he and his knights reverted to their true forms as Skrulls. The former knights remained silent as their leader explained the situation on the planet to the visitors from Earth, then the entire group of Skrulls returned to the castle, boarded their starship which had been concealed as one of its towers, and blasted off to find new worlds to master and transform. Note: Aside from the Dark Knight of Astralon, none of the knights were named but Gorr did mockingly address one of them as "Sir Lout."